Good times. Good food. Beads. All that. But limiting that sort of Southern soul food revelry to one fat little Tuesday seems almost... unfair. 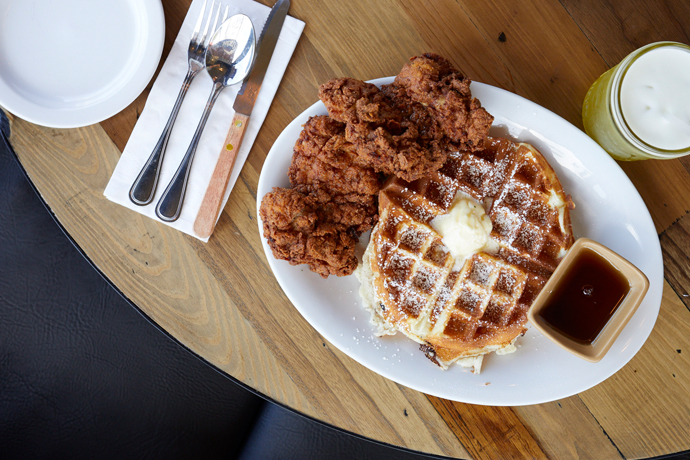 Welcome Criolla Kitchen, your new headquarters for Southern fried chicken, hush puppies and a laundry list of other time-honored soul food staples cooked up by a third-generation Louisiana native, now open on Market. You should know that they’re moving toward being open 24 hours like predecessor Bagdad Café. In the meantime, you can stop in as early as 6pm (and order until about 11pm) whenever you’re looking for something quick and hearty. Maybe it’s the slowly rotating ceiling fans in front of the looming exposed-brick wall. Or it could be the mezzanine that’s slightly reminiscent of a white picket fence. Either way, it’ll feel like time moves a little slower and that there’s this open, airy feel—almost as if you’re sitting on a porch overlooking Bourbon Street. Grab one of the stools at the marble bar (hard to miss since they’re nearly a dead match to the color of the homemade hot sauce) and try the Plancha Seared Catfish or the andouille/Angus Criolla-Burger. They’re looking to get their beer and wine license approved any minute now. Until then, you can take matters into your own hands.